I'm starting a new series: Five Faves Friday (or something like that). It's a simple concept... I'm going to pick five items I'm loving (beauty, skincare, music, electronics, concepts, books, anything) and share them with you in a Friday post. A quick and fun way to share the items I'm discovering (or re-discovering). 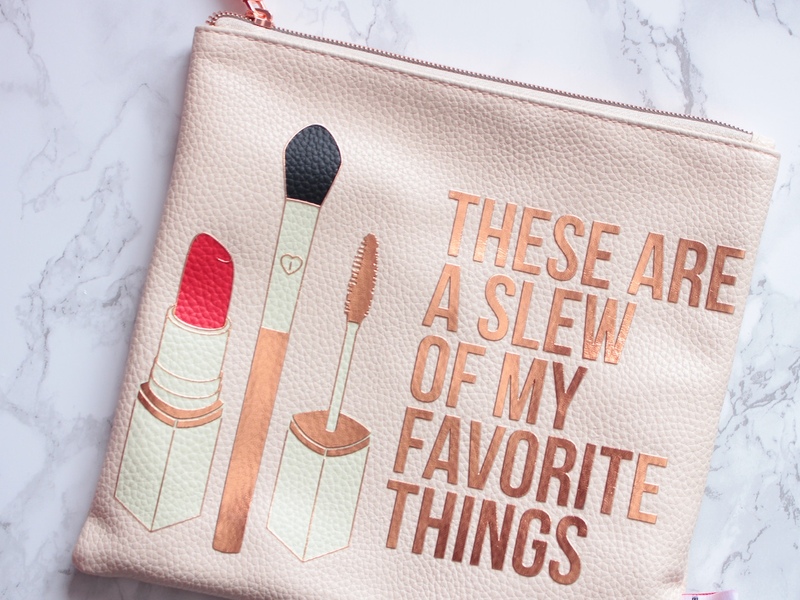 I'm a sucker for makeup bags, especially ones that have cute slogans and rose gold details. This Breakups to Makeup Holiday Bag, which I picked up on sale for a steal, is my new favourite keep-all for the random bits I house in my purse. Aside from the adorable illustrations, surprisingly sturdy faux leather, and appropriate motto, there's nothing really special about it, but in my bag it lies, holding more than a slew of my favourite things. How apropos, right? I've had this blush since it was first released and I've have been obsessed with it ever since. This particular beauty (pictured below) is actually a brand new one. The original blush (R.I.P.) met an unfortunate, yet likely fate. You see, I'm very clumsy... It was actually a pleasant surprise that it took me over two years to drop this compact and shatter the powder. 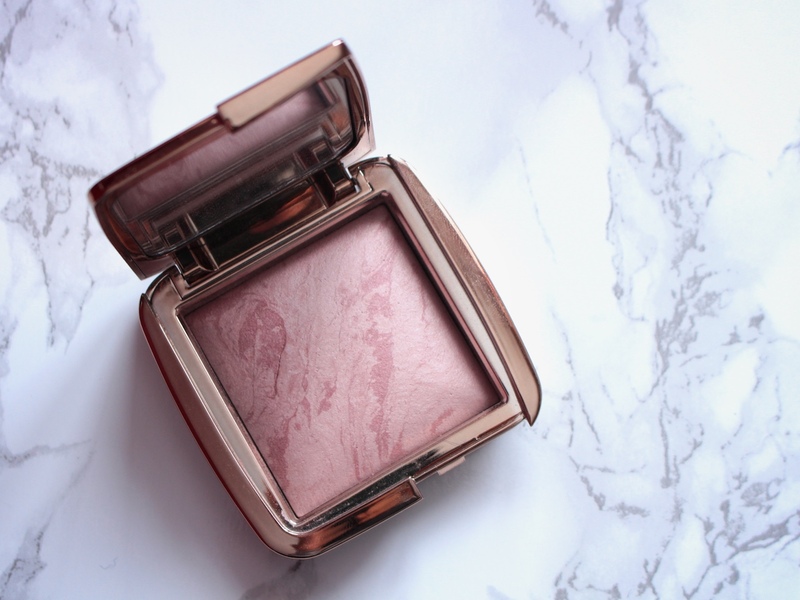 Of course, I immediately went out and picked up a new one because I could not live without this plummy taupe blush. Don't let my unflattering description fool you, it actually looks beautiful on the cheeks. These Hourglass blushes have 50% blush pigment and 50% ambient lighting powder, so every blush is swirled differently. Despite the fact that my old compact had more prominent blush veins, I haven't noticed a difference in application. 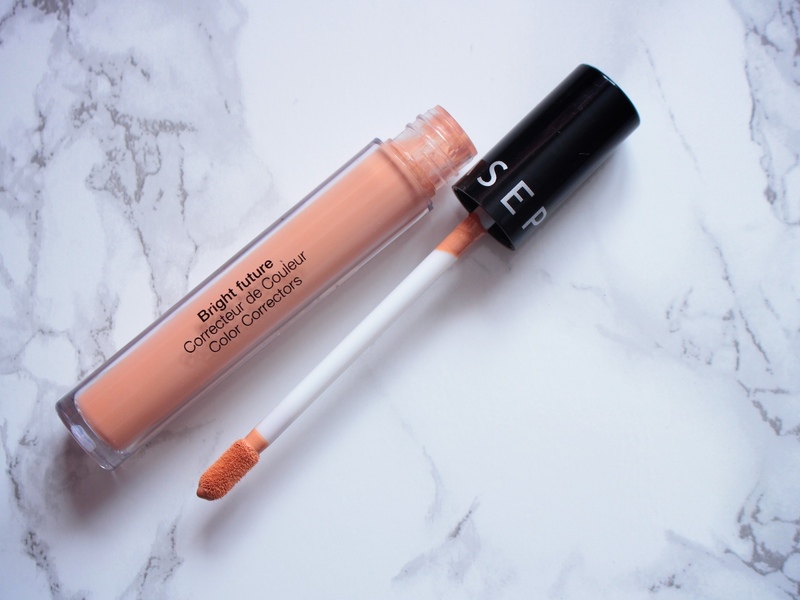 Ever since I discovered the Giorgio Armani Master Corrector #2, I haven't been able to live without an orange-y toned product to minimize the dark circles under my eyes. Naturally when Sephora came out with their own version, I had to try it (especially since I have been loving their Future Gel Serum Concealer). I gotta say, this stuff is good. I use #5 Melon & it's very similar to my beloved GA Corrector. Remember, this is not a concealer. It won't cover up the dark circles entirely, but it certainly does a good job of offsetting the bluish-purple rings under my eyes. It's easy to apply, easy to blend, and quick to set. I find less is more with this product... if you apply too much, it will bunch and cake. Cons? Well, I do find the applicator a bit cumbersome to use. All the product bunches up at the tip of the applicator and I always find myself having to dot the product on rather than sweep it on. That's it, really. I love Bite Beauty's High Pigment Pencils. They're long-wearing yet comfortable on the lips—I can't say that about many products. 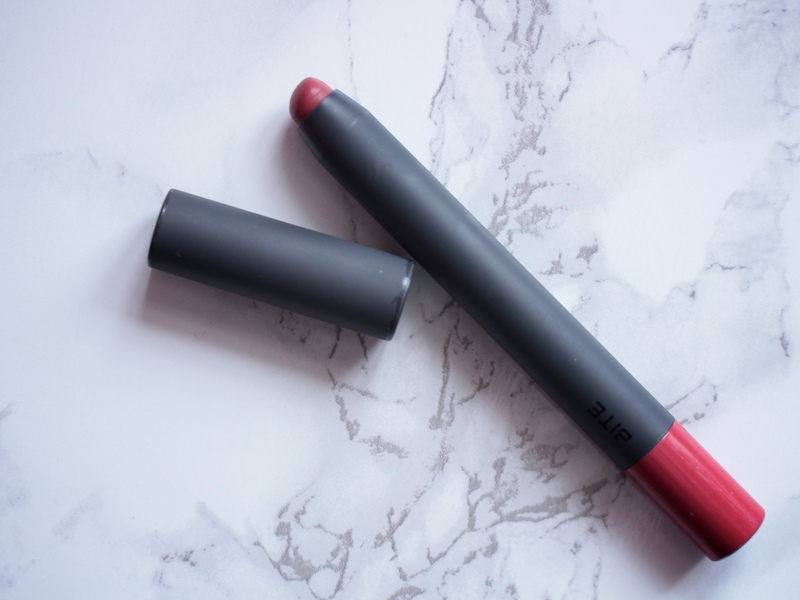 Rhubarb, a beautiful berry rose shade, has been my go-to everyday lip recently. It has more of a flat satin finish (not quite matte) and it's really easy to wear. I also love when lip pencils come in twist-up packaging—so convenient. 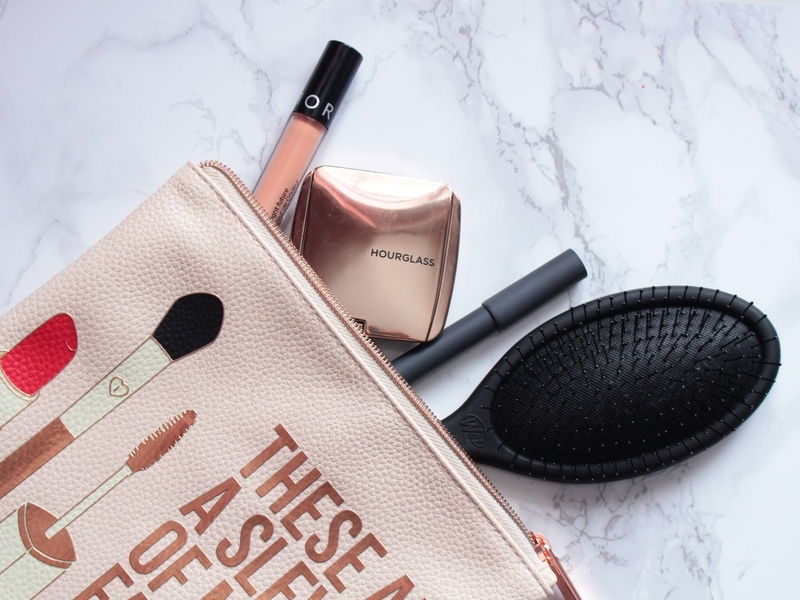 Perfect for wet, knotted hair, the Wet Brush has a permanent home on my bathroom vanity and in my gym bag (yes, I am now the proud owner of two duplicate brushes). I love it because it effortlessly untangles unruly post-swim hair. 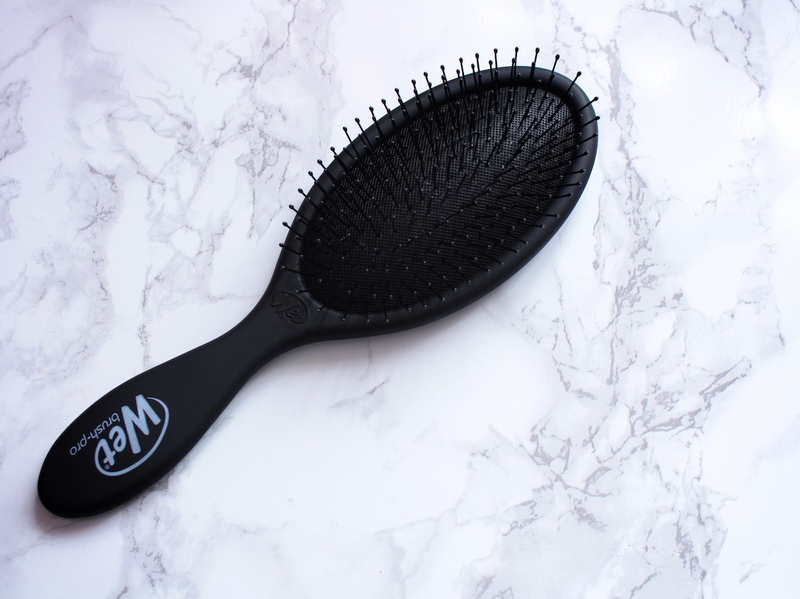 I also have a Tangle Teezer in my arsenal, but even though it has an easy ergonomic design that fits perfectly in the palm, there's something satisfying about a hair brush with a good ol' handle. These brushes come in lots of fun colours and finishes (I was tempted by the gold chrome one), but in the end, the classic matte black won my heart. That's the round-up of products that have been on my mind, in my bag, on my lips, and through my hair. Let me know what products you've been loving this week! Happy Fri-Yay & have a great weekend!